Have you ever attended a presentation held by someone who seemed to possess the skilleton key to an effective public speaking delivery ,but you don’t? Something that all excellent public speakers have in common ? or it is something that is hard to undersdand and practice? 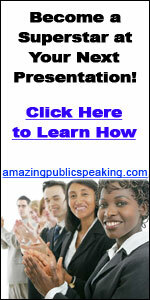 Have you ever thought that those skilled public speakers were born with this gift? Well, the answer would be shocking! No one of the listed above questions have a “yes-answer”, simply because there is nothing separate good public speakers from the bad ones, since there is no secret to perfect public speking anymore. Alright, for the seek of simplicity, there is noone on the surface of this globe could speak before the public without being nervous and anxious. Let’s be straight out , you will be very surprised to discover that fear of public speaking Is on power of death, yes there are people out there prefere to die instead of making a simple presentation. So it is clear that you can’t overcome that feeling completely .the only option that is left for you is to learn how to deal with that feeling of fear or in other words how to minimize your anxiety during a presentation. The key here is to act confidentaly, That is to say, when you observe a terrified public speaker , undoubtedly, you notice that he is not acting confidentaly by doing the exact opposite by looking scared (PITY!) whereas good public speakers look comfortable and in controle of themselves.however, I can guarantee that all of them feel a certain amount of nervosity before they give a speech. 1) Eliminate the idea that the speaker should perform perfectly without being mistaken .simply because this is humain nature no one has the capability to overcome it. 2) visualize yourself on stage delivering an exceptional presentation, dealing with your listeners, answering their questions and so on. Bear in mind that your audience want you to succeed. 3) be well prepared, however do not look like that you’ve learnt your presentation by heart because it effects your credibility.you must be prepared so as to gain self-confidence, this can be achieved by believing on what you say. 4) realize that the vast majority of your audience’s members are thinking about something else while you are speaking. Remember Nobody ever died from stage fright or speaking in public. 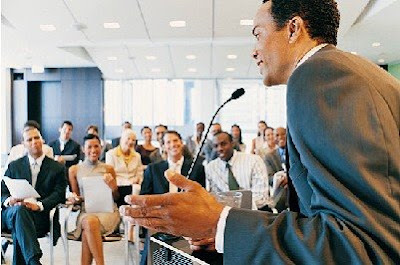 try out some of the tactics in this blog”public-speaking-tips1.blogspot.com”to help get yourself under control. understand that you may never overcome this nervousness, but you can learn to keep it under controle , and use it to your advantage in your public speaking efforts. I stoped by ur website n i liked being here! so informative , thoughful n helpful , i read it all (asy style).I'd like being public speaker too coz i can judge myself as skilled person so hope i will!